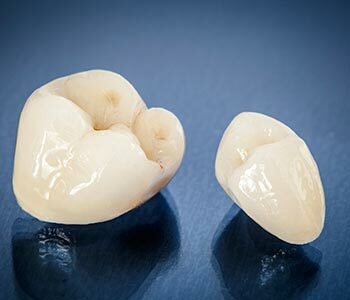 When a tooth is compromised by damage or decay, porcelain restorations, such as crowns, veneers, onlays, and inlays are effective ways to restore it. In the past, this required several office visits. Today, patients have a more convenient option, because we offer CEREC in Gambrills, Maryland. The initial stages of prepping a tooth for this type of treatment are similar to conventional methods. The area of damage is removed, and the tooth is reduced and shaped. That allows the restoration to fit snugly over top, blending naturally with adjacent teeth and into the gum line. That is where the similarity ends. Once Dr. Bingham-Lester has prepped the tooth, she takes a digital scan. Using computer-aided technology, the CEREC® machine designs a restoration with precise contours and fit. Then it takes 15 minutes or less for the device to mill the inlay, onlay, crown or dental bridge here in our Gambrills office. The doctor applies ceramic stains to match the subtle color variations of your teeth, and fires the crown to harden the glaze. Again, this step is done while you wait, and takes only about 20 minutes. Because the design process is so exact, additional fitting and trimming is not usually necessary. The restoration is bonded onto the prepared tooth and you go home with a restored smile; no follow-up visit needed! Learn more about CEREC® and other advanced dental care technologies such as dental implants in Gambrills. The convenience of a completed restoration in one visit. A strong tooth that requires only regular daily hygiene. A trusted technique with more than 25 years of clinical testing. Over 28 million CEREC® restorations have been placed globally. A bridge is a non-surgical way to replace one or many teeth. A bridge uses the adjacent teeth as anchors to support the missing tooth or teeth. With today’s dental advancements, a bridge can be fabricated in a fairly short period of time, using a metal or non-metal foundation. Don’t let that missing tooth affect the way you speak, eat, and smile. Bridges yield immediate results that last a lifetime. Ask your dentist what type of bridge may be right for you. This brief video is packed with information on the dental bridge procedure. This non-surgical treatment replaces one or several missing teeth, restoring ability to eat, speak, and smile with self-assurance. For dental bridges call Dr. Bingham-Lester at Bingham-Lester Dentistry 410-885-6522. Call 410-885-6522 to learn more about CEREC® and other advanced dental care technologies such as dental implants in Gambrills at Bingham-Lester Dentistry. Anonymous "Dr. Bingham-Lester and Ebony were excellent in helping me through the experience of getting a porcelain inlay, the first time I have undergone this procedure. I very much appreciate that Dr. Bingham-Lester suggested an inlay rather than a crown, saving me a considerable sum. Everyone in the practice has been courteous, kind, helpful and very efficient."